I’m editing and formatting the last chapters of my latest Epic Fantasy & Gay Romance book, Pawn Storm, part three of four of The Invisible Hands, the sixth volume in the Dark Tales of Randamor the Recluse series. This means I’m still on course for a release early next week, mainly thanks to my editor who has agreed to work a lot faster, though being ill.
As always when I publish a new book, worries and doubts emerge from all nooks and crannies. Writers are not particularly known for their self-confidence. So, here are a few of the things I wonder about as to how they will be received. First, there is the cover. I’ve decided to go with a more symbolic concept. I hope you like it, or at least don’t hate it too much. It is very difficult to find someone who can draw what you have in mind, and frankly, I was a bit disappointed with how the cover for Castling turned out. I worked with two gifted artists, Irulana for drawing the chess pieces and Adrijus Guscia for the actual design of the cover. Then there is the story. You may remember that The Invisible Hands was meant to be a trilogy, but that halfway through what should have been the third and final part I found there simply was too much story left to fit into one book. The trilogy had to become a quadrilogy. It’s a common observation that often the second book of a trilogy is the weakest. The story seems to sag a bit. That is actually natural. The first part is exposition and introduction. Everything and everyone is new and, hopefully, exciting. We learn about the hero, what he wants and which forces oppose him. The story is going uphill. The second volume usually develops the story further, but friends and enemies are established. The story reaches a plateau. In the third volume events accelerate, to the point of almost getting out of hand and often seeming desperate. The story thunders downhill to a final conflict and resolution. In this sense, The Invisible Hands has two middle parts, Castling and Pawn Storm. An added complication, and a possible source of disappointment, is that, due to the nature of the story, the two main characters are separated. Ehandar is still in Great Renuvia and is scarcely heard of while Anaxantis is on campaign in the southern regions. Of him we hear a whole lot more. Their reunion (and it will be a rather dramatic one, I promise) will have to wait for the next book, Mate. Mate will continue the story right after the events of Pawn Storm and will reverse this situation. We’ll leave a lot of characters behind in the south and the main action will be centered around Ehandar and Anaxantis, at first separately and later reunited. To compensate for this, in Pawn Storm there is the developing relationship of Lexyntas and Thenoclon. Arranulf and Hemarchidas as well figure prominently in this book, as do Antybion and Yorn. Lorcko and Timishi have their parts to play too. Expect many twists and turns. There is a lot of political intrigue and double-dealing. There is a major battle and a minor armed conflict after which the identity of the prince of Trachia in hiding will be revealed. Although there will be a revelation and sort of an end-and-new-beginning, there are also some cliffhangers. I hope you’ll enjoy reading Pawn Storm as much as I loved writing it. 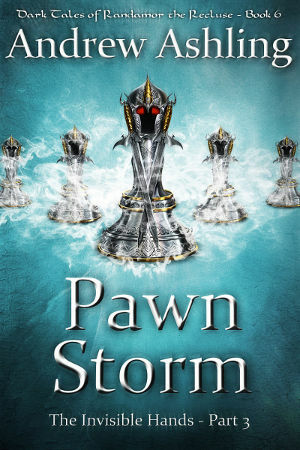 If you want to receive an email on the exact day Pawn Storm goes live, please subscribe to my New Releases Newsletter. I’m on pins and needles waiting for this one! About a week from now… maybe less. Your cover looks spectacular, Andrew. I’m excited about this release and look forward to reading my way toward it. The cover is great and I look forward to this one. I’ve been waiting with anticipation for its release. How you deal with self-confidence is up to you, but I love your books. I’ve just read the Game of Thrones series ( a detour from epic fantasy with gay heroes) and I think your series is superior, especially in the pacing of the plot. That’s high praise… and a great restorer of shaky self-confidence. The cover is very lovely. Nothing frustrates me more when the characters on the cover don’t match their descriptions within the book. Add that to how your own mind pictures them, and it becomes distracting, and I find the inconsistencies bug me all the way through. I’m sure you’ve read a character described as fair and lithe of figure be represented on the cover with black hair, swarthy skin and built like the incredible hulk. Eagerly awaiting the publication of pawn. Well, that’s all good news then. I agree completely. Moreover, I don’t think it’s the writer’s — or the cover’s — task to replace the reader’s imagination. It’s enough to stimulate it. That’s why I try to keep the descriptions of the characters rather fuzzy, but just enough to give you an idea of the general type. I hope that will be sufficient for your own imagination to bring the characters to life.